Margaret Battye (WA) wore her wig well. The question of what lawyers wear is in the news again since the Family Court of Australia has announced that judges have new robes, it will dispense with wigs, and there is a new dress code for lawyers appearing before it. The Family Court changes caused me to think again about the reason behind court dress – and others too, as evidenced by an animated discussion on Twitter following the Court’s announcement. Part of the philosophy of the establishment of the Family Court was accessibility to the public, and part of this included less formality in the attire of the bench and bar. A spate of violent attacks in the 1980s resulting in the death of one judge and the wife of another (remembered here), caused a rethinking of the rules about dress in the Family Court. It was thought that without a wig and gown, the judge was personalised leaving them vulnerable to attack by aggrieved litigants. 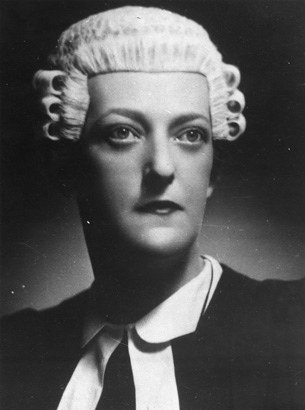 With a wig and gown however, the judge simply represented the authority of the state – giving the judge as a person anonymity and therefore protection. So is there a link between attire, authority and identity? These questions were posed in the context of the UK courts’ working dress reforms in 2008. Those objecting to changes to traditional court dress argued that in particular in criminal trials, the wig and gown lent dignity and authority to the court and anonymity to those wearing them. Loss of wigs would therefore reduce dignity and authority. UK solicitor-advocates who have traditionally worn no wig have argued that they should be allowed to wear one so as to retain credibility in the company of wigged barristers. This suggests an overwhelming belief in the power of the wig. The fact that Betty Jackson, designer of ‘funky British clothes for aspiring funky British girls’ was commissioned to design the new gowns is indicative of a desire to break with tradition. These debates within the profession and judiciary in the UK would in all likelihood mirror attitudes in Australia: that on the one hand traditional court dress implies authority, dignity and credibility; but on the other represents a distant and out-of-touch judiciary and profession. The issue of safety, apparently behind the original Family Court adoption of more formal attire, does not seem to have arisen in the UK context of modernising court dress. … these arguments struck me as vaguely familiar. I had heard them before in some other, different connection. After careful research I have determined that these are precisely the same reasons Batman gives for wearing his mask and cape. Batman, like the … judiciary, seeks through his bizarre and slightly anachronistic apparel (after all, who wears a cape these days?) to ‘strike fear into the hearts of criminals everywhere.’ Moreover, both the English judges and Batman use their costumes to hide their ‘secret identity,’ which is, in fact, their ordinary everyday identity, the one they use when they are not busy fighting crime. UPDATE: the Irish courts have also recently changed their rules, reviewed by Eoin O’Dell at his cearta.ie blog here. Does traditional court attire lend dignity, authority and credibility? Or is it outdated? Guest blogger Kate Galloway teaches law at James Cook University. You can follow her blog at Curl, and on twitter at @KatGallow. I see a point for gowns for judges, barristers and solicitors alike. They reinforce the idea that we are all just discharging our roles in the legal profession and that it’s not personal. They also signify a unity amongst a profession that has much in common but practices as disparate entities. The wigs however have to go. They hark from the days when the elite wore wigs to protect themselves from things throw out windows (think “night soil”) and have no relevance today. They don’t add any authority that the gowns don’t already provide. My experience is that too few barristers clean them regularly – some wigs border on being a health hazard! Agree with modern practice of Federal Court – robes for final hearings, but not directions hearings or interlocutory hearings. “I will not reveal her identity” – I love it!